October was a busy month for me, with two major, consecutive greenhouse conferences taking place mid-month — the Canadian Greenhouse Conference and the Indoor Ag-Con. They looked to be great events so I wanted to make sure and get to both of them — even if it made for a travel-packed schedule. 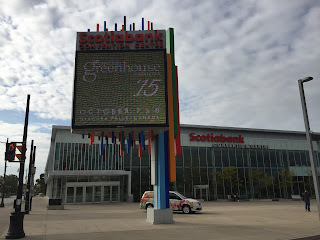 First I went to beautiful Niagara Falls, Ontario, the week of October 5th, for the Canadian Greenhouse Conference. 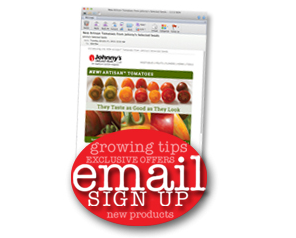 The Canadian greenhouse industry is highly advanced, so I knew there would be good information and vendors. The highlights included the many developments underway in the use of beneficial insects to control pests, with an informative discussion on how to identify pests and the best biocontrols to combat them without the use of harmful chemicals. There was also a lot of talk about how to make greenhouses more efficient. In addition to hearing about the many ongoing developments in LED lighting and other technologies to increase energy efficiency, I sat in on a great presentation on a program by the Dutch government that is working towards having zero water and fertilizer emissions from greenhouses. It is not a new idea that the ideal greenhouse would be one that produces no emissions whatsoever, and the technology is now catching up with the idea. In a country like Holland with a big greenhouse industry, reducing or even eliminating the amount of greenhouse emissions could have a big impact on improving the environment. As the technology comes on line to accomplish this, the Dutch government is tightening emissions standards to prompt growers to install newer, more efficient technology. It is exciting to see the technology being developed for cleaner greenhouses, because the Dutch tend to come up with a lot of the greenhouse innovations that end up being adopted worldwide. Other useful workshops included how to train and motivate workers, how to understand soil and water tests, and how to mix your own custom fertilizer solution. Overall, a very good conference that is worth attending for greenhouse growers. 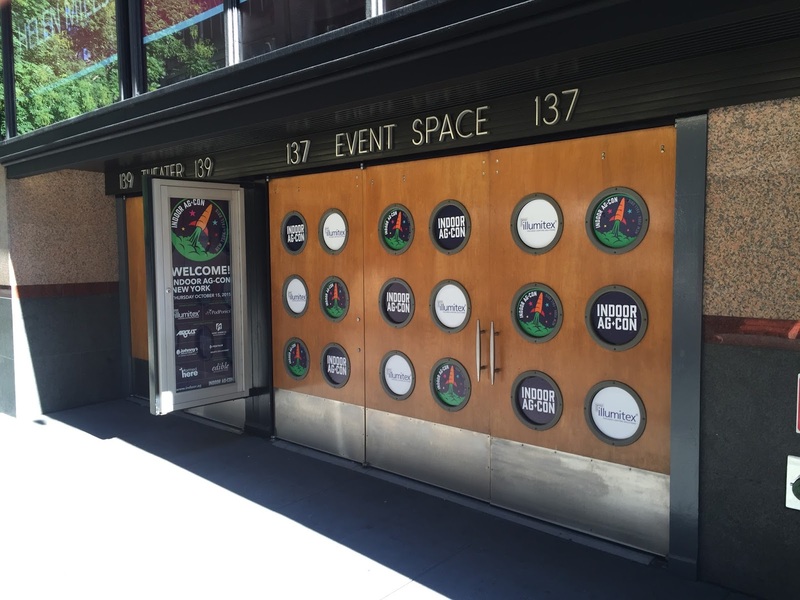 The next week I went down to New York City for the first East Coast Indoor Ag-Con. This conference has been held three times in the past in Las Vegas, and is branching out into Asia with a conference in Singapore in January 2016, and is being held again in Las Vegas in April 2016. 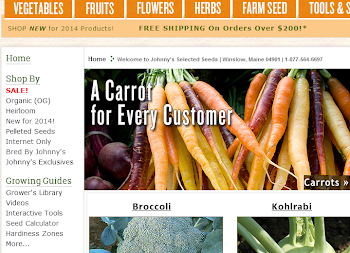 If you look closely you can see that Johnny's was an event sponsor for Indoor Ag-Con! This was a visionary conference, in that it focused on technological innovation leading the vanguard of protected agriculture. It provided a forum for those working on next-generation greenhouse technology to present their work and perspectives. 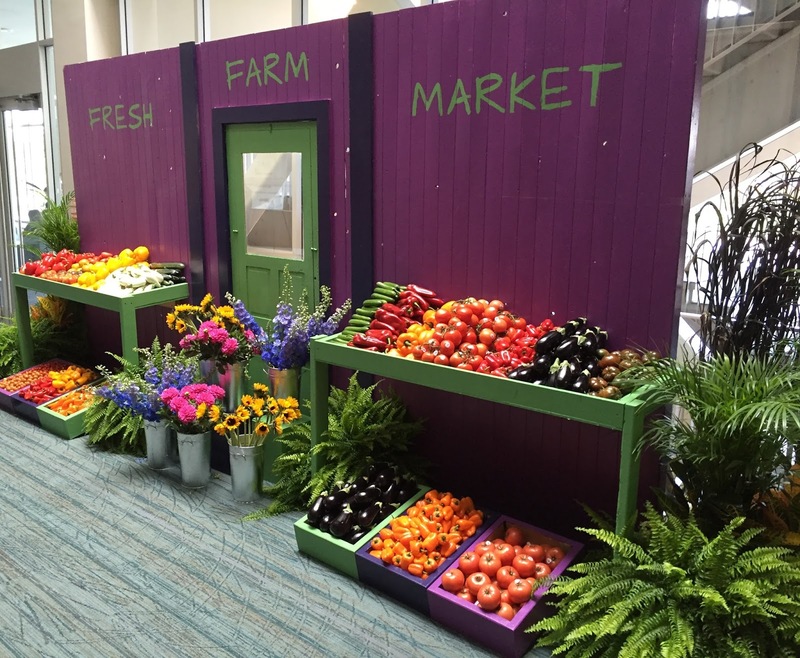 Examples of topics that get a lot of attention include use of LED lighting, aquaponics, vertical greenhouses, aeroponics, and urban greenhouses. 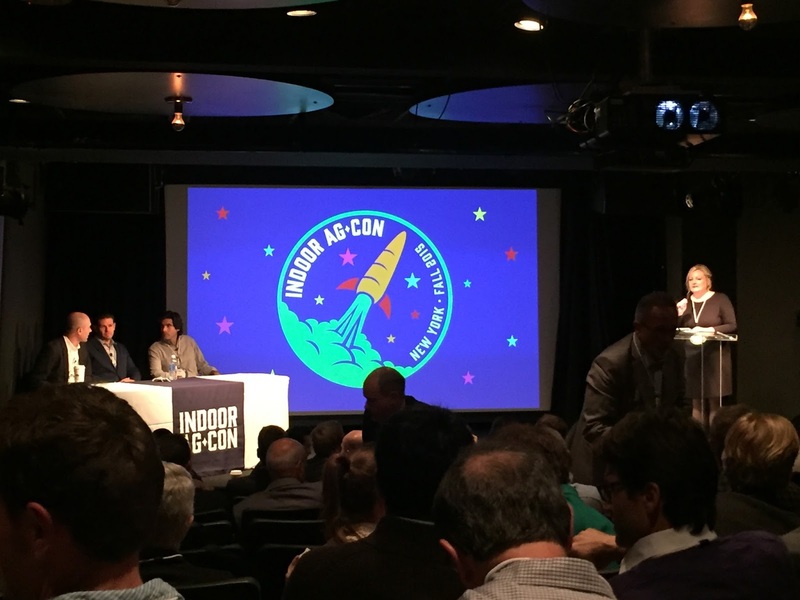 I feel this conference gives us a glimpse into the future of indoor agriculture. Even if all of the innovations don’t become commonplace, chances are some of the new technologies being discussed will become standards in the future. The conference sold out, so maybe they will consider a multi-day format on the East Coast as they have in the past the West. Overall, it was a very informative and inspiring conference. Both conferences got me excited about the potential for improving protected agriculture, though they did make for a very busy October! Visit our Grower’s Library, where you can read more about attracting and putting beneficial insects to work; as well as controlled environment agriculture, including Johnny’s greenhouse trialing program, what to look for when choosing which varieties to grow under protected culture, and recent advances in protected culture crop production. As you’ll recall from the closing images of our June 26th post about planting our sweet potato trial, the slips were drooping and wilted — less than healthy appearing. Sweet potatoes are a tropical plant, so we covered them with AG-19 row cover to protect them from the weather, which can still be rather cool in Maine during late spring and early summer. Now into mid-July, the row cover has been removed, and as you can see in the photos, the vines that looked questionable after planting are alive and healthy. The foliage is a lush green, and there is little evidence of pests, and no evidence of disease. However, due to the cool summer we are having in Central Maine, the plants are not as vigorous and sprawling as they would be in warmer climates. 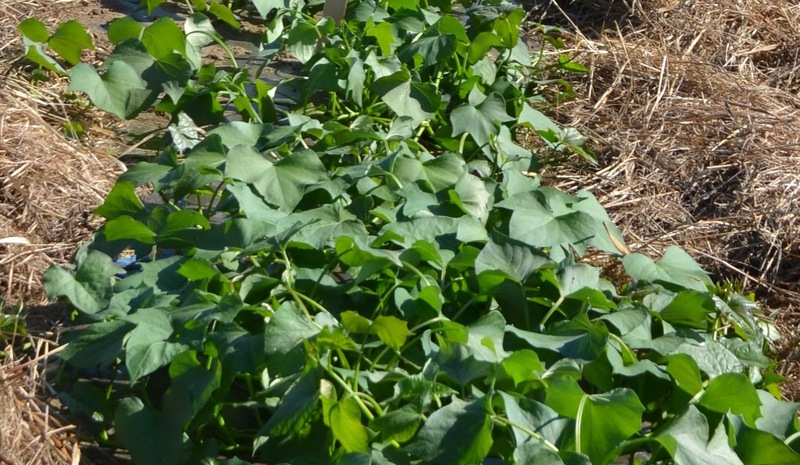 For those of you growing our newly-added variety, Mahon Yam™, you will notice something distinctly different about its leaves in comparison to other sweet potatoes you may have grown in the past. Standard sweet potatoes have moderately lobed palmate or cordate leaves. or cordate to triangular leaves. 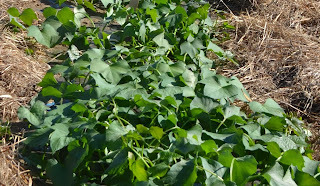 In contrast, Mahon Yams have very deeply lobed leaves, resembling those of Japanese maples. No matter which leaf type your sweet potatoes have, given proper care and growing conditions you will have storage roots to enjoy at harvest time — we're looking forward to sampling the fruits of our yam trials! Here is a selfie of me with the tourist info booth in Leamington, which is a giant tomato. 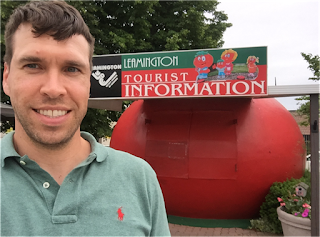 Unfortunately, it wasn’t open when I was there — or there would be a helpful person inside the giant tomato. This proximity to such a large body of water gives the area a “lake effect” climate, which helps smooth out the spikes and dips in temperature, making it a good area for growing all kinds of crops. 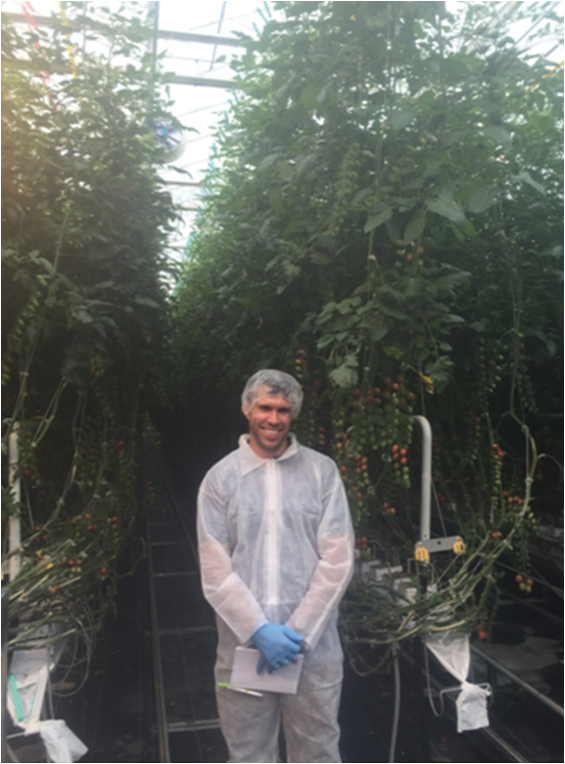 Because of the high number of growers in the area, this is where newly developed greenhouse varieties are trialed and demonstrated. For tomato nerds like myself, this is an exciting place to be because the demonstration greenhouses act as a “living catalog” where I can see new varieties growing and taste them and determine if they are something that Johnny’s customers would be interested in. Unfortunately, because these demonstration greenhouses receive so many visitors, I was not allowed to take pictures in most of them. Biosecurity is taken very seriously, as pests or pathogens could be brought in on almost any object that has also been inside other greenhouses. Even the people have to cover up — see my photo below. Even if not taken to this extent, having some kind of plan to keep diseases out of the greenhouse is a good idea for every grower. This is especially important for growers who have field and greenhouse operations on the same farm. It is very easy for workers to bring pathogens into the greenhouse if they go straight from working on one crop in the field to working on the same crop in a greenhouse. Luckily, I was able to take photos in some places, even if I had to put my phone in a bag. It is always interesting to go to field days and see the new developments. Breeders are constantly working to help overcome the production problems of growers by developing new varieties that are more resistant to pests and diseases, and have better flavor. These kinds of visits also provide a great opportunity to learn and share ideas with other growers, find out what their difficulties are and how they are able to overcome them. In this greenhouse, I was allowed to get some photos of the new varieties on display. 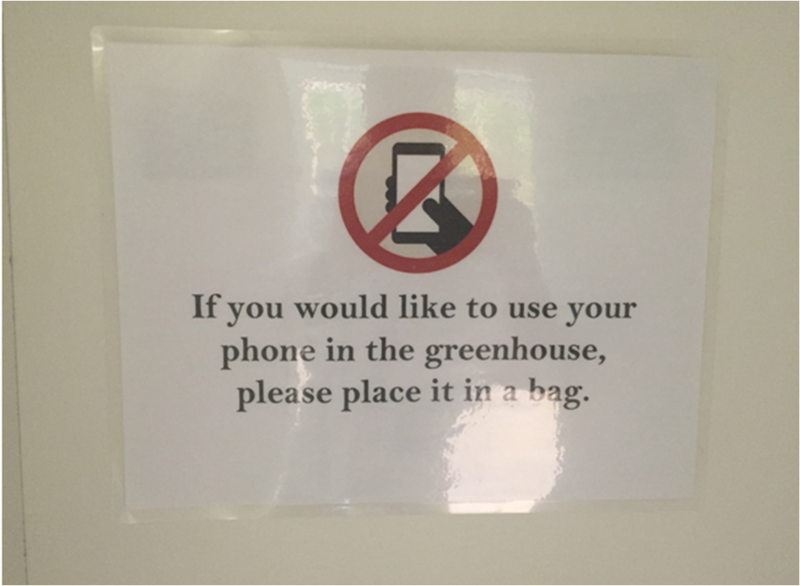 Also, I was able to get someone else to take a picture of the type of precautions that are taken to ensure that no diseases make it into the greenhouse. There were some very nice new varieties this year, including new cucumbers, peppers, eggplant, and tomatoes. Many of the new cucumbers for greenhouse production have resistance to cucumber green mottle mosaic virus (CGMMV), a disease which is becoming more and more common in greenhouses in North America. There were also some nice new tomato varieties on display. I am particularly excited about a very sweet and flavorful grape tomato for greenhouse production which may be available soon. After three days in “Tomatoville,” I left town with many new growing ideas and potential new varieties in mind. It’s always great to visit and enjoy the warm hospitality of my Canadian hosts. For updates on these varieties, stay tuned to your next Johnny’s catalog to see if any of them make the cut in our trials this year and make it into the catalog. Packages containing sweet potato slips were shipping at a steady rate earlier this month. When live plants are delivered, it’s always best to plant them immediately — but when life and changes in the weather intervene, that isn’t always possible. Here’s how to keep your slips healthy until you can put them in the ground. Open the box as soon as it arrives. The rigors of shipping can leave them looking the worse for wear, with pale, wilted, or even dead leaves. But this is not ordinarily cause for alarm— sweet potato slips are stronger than they appear. There may be variation in the size of the slips and the extent of the finer, fibrous white roots growing off of them. Some slips won’t have fibrous roots, some will have many, but they will all grow if planted in the proper environment. If it’s just a day or two before you’ll be planting, simply moisten a paper towel and loosely wrap it around the root ends of the slips (if the slips do not have any fibrous roots, just wrap up the cut end). Sweet potatoes are of tropical origin and do not fare well in temperatures below 60°F/16°C, so keep them at room temperature. Protect them from direct sunlight, and prop them upright — often we will stick each bundle of slips in a glass or jar if we expect to be planting them within a day or so. We were unable to plant our trial immediately due to cool wet weather, so our slips received long-term care to keep them happy until conditions improved. If you need to hold your slips for more than a couple days, here’s what to do. After opening the box, gently and loosely separate the roots from one another, discarding any peat moss from the roots’ storage that was shipped with the plants. Fill a container half full with potting mix. Arrange the slips loosely in a circle around the edges of the container, then fill the rest of the container with more potting mix. If the slips have fibrous roots, try to cover them with the potting mix. Water around the slips to help settle the potting medium, and add more medium if needed. Store at room temperature, out of direct sunlight (we put them under an occupied greenhouse bench). If you have received more than one sweet potato variety, as we had, be sure to plant the slips in separate containers and label accordingly. Keep the containers moist. In just a day or two, they will be flourishing with bright, healthy leaves. 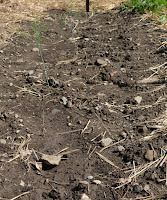 Here’s the last update ‘til fall for our newly planted asparagus crown bed. At the end of the last post, we mentioned that as the spears grow, you will gradually fill in your furrow with soil until its top surface is even with the surrounding soil line. We have been doing this since our last post, adding the final layer of soil to finish filling in the furrow today. The process is the same as before: Gently pull soil into the furrow, while not completely covering any buds that are still emerging. Yesterday a large afternoon thunderstorm had already started to fill the furrow with surrounding soil. We used a collinear hoe to once more level out the rest of it. You might notice in the photos that some of the crowns are establishing faster than others and those spears have already grown well above the soil line. This is okay – some are just slower to snap out of their stay in cold storage than others and will catch up eventually. Now that the soil level is where it should be, the next step is to cover the bed with mulch to suppress any weeds that might begin to grow. Keeping your asparagus bed free of weeds will not only save you a lot of labor, but support nutrient and moisture availability to the crowns. We use straw to mulch our bed, but other materials that allow water to percolate through, such as composted leaves, can also be used. Leave a couple inches of soil surface open around the line of spears down the center, of the bed, or keep the mulch layer thin in this area, especially if there are any crowns with spears that have not yet emerged above the soil line. Your asparagus bed is now well set until fall — but keep an eye on it, and keep the soil moderately moist throughout the hot summer months. In the fall, when the fronds have died back, cut them off at soil level, and be sure to remove all the debris, to eliminate potential habitat for asparagus beetles. Fall is also the time to add more compost, if needed, and to freshen up the mulch for the winter ahead. From our last post you’ll recall that we planted a new bed of asparagus crowns at Johnny’s Research Farm in Albion on May 4th. Prior to planting, we dug an 8”-deep trench, but following planting did not fill the trench back up to the soil line. Now that the spears have started emerging from the soil, it’s time to add another layer of soil. This is a fairly simple process. All you need to do is use some sort of gardening tool — a rake, a stirrup hoe, a small pitchfork — and gently add soil to the furrow. We used a collinear hoe (see image below). Do not cover the spears all of the way; leave the top of the bud still showing above the soil. 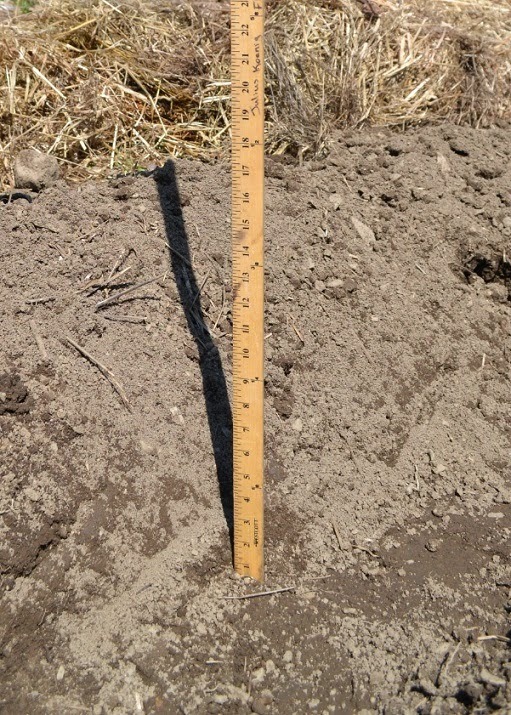 The furrow still won’t be completely filled in at this point; you are only adding one more layer of 2–3” of soil. In another week or so, after waiting for the spears to emerge again, you will need to add more soil back into the furrow. Repeat until the amount of soil in the furrow is even with the soil line. 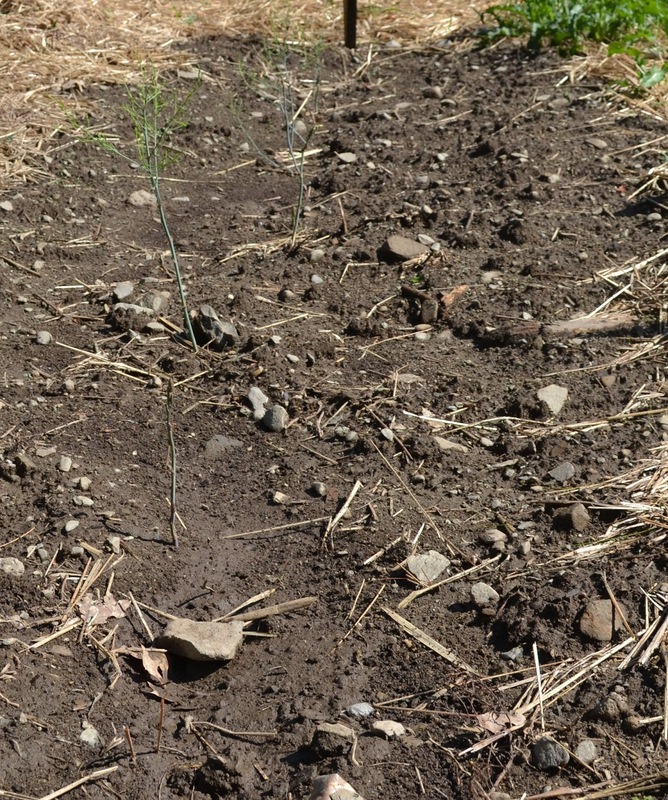 Although you’ll be eager to begin harvesting, establishing an asparagus bed requires patience. It is not until a full year after planting that the spears will be of harvestable size. Even then, your first harvest will be short. The reward for waiting, if you maintain the asparagus bed properly, is it will continue to produce well for upwards of 15 years!